Crooks have been copying money ever since its invention. Ancient gold coins were faked by filling them with lead; counterfeits as simple as a slug were used to defeat older vending machines; and these days fake money is made using printing presses or laser printers. The ability to detect counterfeit bills is a valuable skill to learn by anyone who handles money on a regular basis. To encourage this skill the Secret Service prints a pamphlet called Know Your Money (viewable online) that describes how to detect counterfeit bills. The guide assumes that the person receiving a bill will pay attention to the details of the bill. Of course experience also helps; sometimes a counterfeit bill just doesn’t ‘feel’ or ‘look’ right. Machines also exist that will assist in sorting legitimate bills from fake, but these machines are not perfect. The best detection of counterfeit money is still a person who is familiar with currency and pays attention. And then there is the Counterfeit Money Detector Pen. This pen, made and patented by DriMark Products, seems to instantly determine the validity of paper currency using a process that is mysterious to most users. A cashier merely marks a bill with this pen, and if the mark is yellowish, amber or clear then the currency is valid. If the mark turns dark brown or black then the currency is phony. Cashiers take great comfort in this patented process. I’ve seen clerks at the local corner market use these pens on ten-dollar bills. I’ve seen cashiers at my credit union use these pens to check hundred dollar bills. And I’ve noticed that in all cases that when the pen is used the attendant instantly trusts the results. Let me restate that. It is possible that an inexperienced cashier, or one who is in a hurry, will accept counterfeit money as authentic if it passes the ‘pen test,’ even if that currency would clearly be detectable as counterfeit to another person who took the time to examine it. Most cashiers seem to have a blind faith in these pens. How does the pen work? As I mentioned, this pen is patented. The patent number is 5,063,163 , and can be seen online at the United States Patent and Trademark Office. According to the patent claims, this pen contains a testing solution comprised of one of several different chemical recipes. The active ingredient is Iodine, and the remainder is one of several solvents. The patent claims that this solution will detect, “…illegitimate paper currency by detecting the starch content therein in excess of the genuine currency.” It does this using a known reaction between Iodine and starch, called an ‘Iodine Test’. The Iodine Test is a standard chemical method of detecting starch. Simply stated Iodine reacts with starch to produce a deep blue-black color. (Here is another link for those interested in the chemistry of the Iodine Test.) The test solution in the DriMark pen is naturally a light golden-brown or yellowish color, but when mixed with starch the color changes dramatically to a dark black. One of the ways that the United States Mint has tried to combat counterfeited bills is to use distinctive paper. Standard paper, like the kind used in a copy machine, is composed of wood cellulose bound together with starch-based glue. Paper used in currency is composed of cotton or linen fabric that has been beaten and cooked to create fine fibers. The process causes the fibers to interlock naturally without the requirement of a starch binding material which makes for a very strong, high quality paper. Paper used for United States currency has other additions, such as tiny red and blue fibers and a plastic / metallic strip embedded in it. Due to the method of manufacture, paper currency will not disintegrate or weaken substantially when wet. There is very little, if any, starch in American currency. James Randi has tried to tell people that these pens give a false sense of comfort to those who trust them over all other means of counterfeit detection. He hasn’t had much success in his attempt at education, and I can sympathize. I have also tried to explain to my credit union tellers that they should learn how to use their senses to discover counterfeits. I’m still trying, patiently, to educate. I love to read James Randi’s weekly Swift Commentary because I learn so much from him. Perhaps the biggest lesson I’ve taken from Randi and other skeptics is that as a skeptic I’m NOT required to blindly believe what they say. I’m allowed and encouraged to find competing opinions, do my own research, or even perform my own experiments. So in this vein I decided to run my own experiment on the counterfeit detection pen. Will DriMark’s Counterfeit Detection Pen respond properly to paper currency and standard computer paper? Is there another sort of paper that would be detected as ‘currency’ by the pen? Randi coats money with spray starch to fool the pen – does that work? If I find a non-currency paper that fools the pen, can I spray it with starch so that it will then read as ‘counterfeit’? I’ve read that hairspray would defeat the pen and cause it to indicate non-currency paper is valid currency. Is this true? Can I cause starch-soaked currency to read as valid? DriMark Counterfeit Detector Pen with adhesive holder! (It was cheaper than purchasing 3 to a package.) Patent number 5,063,163 is proudly printed on the bottom of the package. Dollar bills. I used four singles instead of twenties, fifties or hundreds for two reasons. First, I’ll be writing on these bills with a counterfeit detection pen, and I don’t want a cashier to refuse my money because they think it’s funny. Second, I’m not so rich that I can play with hundred dollar bills! Starch. I could have used a powder starch and mixed it with water, but who needs that hassle? I used Niagara spray starch because I’m familiar with it from using it every week for ten years while I was in the Air Force. Computer paper, coffee filters, paper towels. Other sorts of paper to experiment on, and to use to clean up my mess afterwards. One domestic felines, absolutely required as an impartial observer and judge. My feline owner, a Mr. Samuel Francisco, (aka Cisco) was gracious enough to volunteer his services. Test the pen to make sure it can tell the difference between good money and computer paper. This initial check also serves to prove that the pen is working as advertised. I applied the pen to one of the dollar bills and to a sheet of computer paper (folded in half). Apply spray starch to the next dollar bill in an attempt to make it read as fake. Apply hairspray to the folded computer paper in an attempt to make it read as real. I used an evaporative rotary oscillator to facilitate in the drying of these sprays. 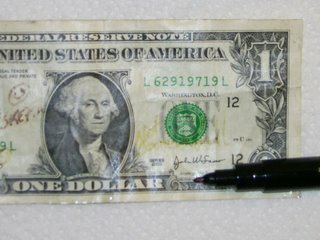 After drying, test the results by re-applying the counterfeit money detector pen to both the dollar and to the computer paper. 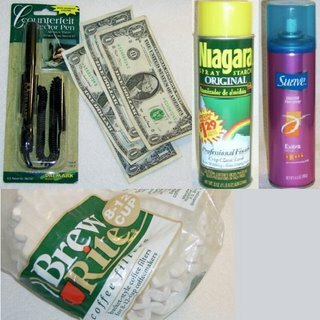 Using the counterfeit money detector pen, test a single coffee filter paper from the package of Brew Rite bargain filters that I found in my cupboard. Spray another coffee filter paper with starch and allow to dry on the evaporative rotary oscillator. Using the counterfeit money detector pen, test the coffee filter sprayed with starch to determine if it registers as counterfeit or real. Using the dollar bill sprayed with starch from item (2) above, spray this bill with hairspray and allow it to dry. Test the bill with the counterfeit money detector pen to determine if it registers as fake or real. Not every lab has such high tech equipment! Writing on money is legal as long as I don’t make it ‘unfit for circulation’ according to title 18, Section 333 of the United States Code. Still I find myself reluctant to write on it, so helpfully I write, “Not Fake” to put any receiving cashiers at ease. 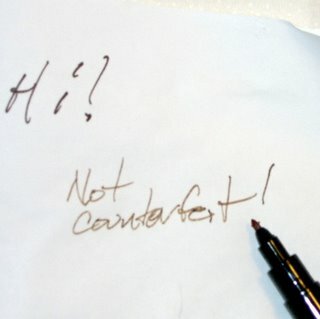 Writing on computer paper is easy except I have a minor bit of writer’s block, so I just give a friendly ‘Hi!’ The pen works as expected – the computer paper is fake money, and the dollar bill is real money. After spraying the bill with starch and the computer paper with hairspray I again test them both with the counterfeit detector pen. As predicted by James Randi, the second dollar bill now reads as counterfeit. The pen now indicates that the hairsprayed computer paper is genuine currency. 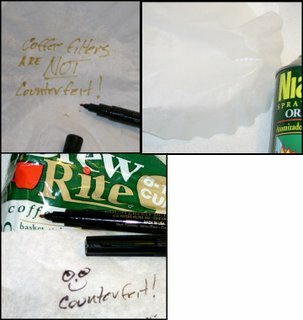 I then tested a coffee filter with the counterfeit pen. The coffee filter is apparently made completely out of genuine American currency paper because the pen indicates that it is NOT counterfeit. I sprayed a new coffee filter with starch and allowed it to dry on the evaporator. Afterwards I tested it with the counterfeit detector pen and found that the coffee filter now (correctly) reads as counterfeit paper. I have no idea what starch will do to my morning cup of coffee, but I’ll bet it isn’t anything good! 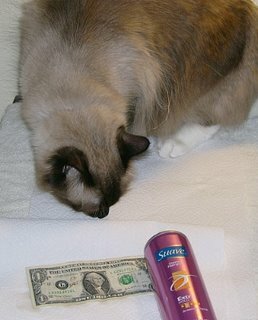 At this point my neutral feline observer decided to preform a randoml quality control inspection while I worked, so I very carefully sprayed the previously starched bill with hair spray under his scrutiny. The starched dollar bill, sprayed with hairspray, is now very shiny in the camera flash, but obviously NOT a counterfeit! Here is a bill that was sprayed with starch, then with hairspray. It 'failed' and registered as counterfeit after being sprayed with starch, and then it 'passed' and registers as real money after being sprayed with hairspray. This treatment results in a bill that has become 'slick' in feel, and somewhat glossy in photos. The 'Skeptic' and smily face became a bit smeared after the application of hair spray. Perhaps I used a bit much? Mr. Samuel Francisco inspects the experiment and gives it his qualified approval before demanding his payment in tinned cubed chicken bits. During this test I accidentally marked one of the paper towels with the counterfeit detector pen, and found out that it was also apparently composed of genuine currency. I did not test these paper towels with starch or hairspray because I learned during cleanup that the starch made them very soggy. 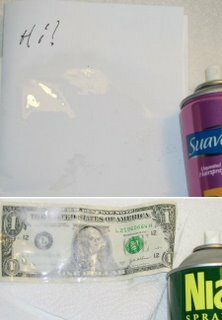 At first I used the spray on, rub dry method of drying the dollar bills after applying starch, but the first bill I tried this on indicated as ‘not counterfeit’ after rubbing with a paper towel. It is my assumption that I didn’t allow enough time for the starch to soak into the bill. All further bills were allowed to dry without interference. The rubbed bill was removed from the experiment. The counterfeit detector pen will indicate that money sprayed with starch is counterfeit. This is due to the reaction between the iodine in the pen and the starch on the paper. The computer paper sprayed with hairspray is detected as genuine currency because the hairspray creates a barrier between the iodine in the pen and the starch that is used as a binding agent in the paper. Some types of paper do not contain starch as a binding agent. Since starch is dissolvable in water, I guess it would be bad for coffee filters or paper towels to be held together with something that would cause them to fall apart during their normal usage. It may also be possible that starch would adversely affect the quality of coffee if it were added during the coffee-making process. Adding starch to coffee filter paper makes it register as counterfeit because the iodine in the detector pen reacts to the added starch. A dollar bill coated with starch and then sprayed with hair spray will be detected as genuine currency by the pen due to the hairspray barrier between the iodine in the pen and the starch on the bill. As a side affect, spraying bills with starch makes them feel a little more 'slick' to my fingers. Spraying them with hairspray makes them feel more 'fuzzy'. Under a camera flash they become very reflective, but look normal under regular lighting. A few weeks ago I made the mistake of leaving my wallet in my pants, which then went through the wash. Luckily I don’t use starch in my wash anymore. (I did when I was in the military.) If you do use starch in your wash, and happen to wash an extra twenty, fifty or hundred dollar bill in your pocket, then you are in danger of having that bill flagged as ‘counterfeit’ by DriMark’s pen. 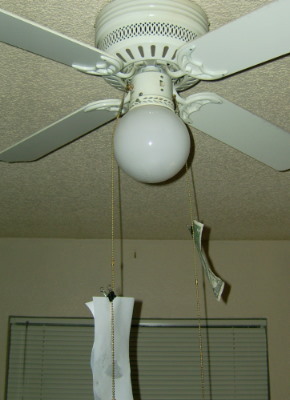 Luckily, you can make your bill ‘good’ again by merely spraying it with hairspray! Counterfeiters who use a laser printer to print fake bills on computer paper could make all their bills acceptable to cashiers who rely on DriMark’s pen by adding a coating of hairspray. In my opinion, counterfeit money detection pens are a scam because DriMark can overcharge the user for inexpensive iodine. The price of these pens is much higher than the price of an equivalent amount of iodine. I purchased this pen for $4 from Office Depot. According to the patent, the counterfeit detector pen is composed of 0.5 to 2.0% iodine. An eight ounce bottle of 10% iodine solution is $12 from Walgreens. If diluted to the proper consistency I predict that the bottle of iodine will be in use long after four DriMark pens have evaporated to uselessness. 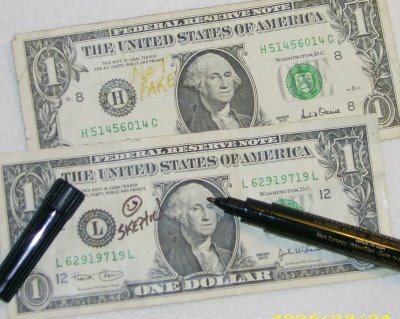 I believe that counterfeit money detection pens are a dangerous scam due to the blind faith that most cashiers have in their ability to detect phony money. Counterfeiters who take the time to create funny money will certainly take the time to defeat these pens. I would guess that counterfeiters actively look for cashiers who rely on these pens because these cashiers are an 'easy target' for disposing of fake bills. Does US currency not have a watermark? In the UK cashiers use the very high-tech measure of holding the note up to the light. I know that the watermark can be recreated, but not as easily as standard printing. But the point is, when the cashier uses the Counterfeit Detector pen, most of the time all other methods of checking the money go out the window. I think the popularity of these pens has something to do with authoritive, clearly 'black and white' answers. If a cashier checks out the bill for himself, he is relying solely on his own judgement. This is scary for some people. But if the pen 'tells' the cashier that the money is good, then not only does the cashier have a (pseudo) authoritive black and white answer, but he also has a built in scapegoat. I'm sure it's more 'comforting' than trusting your own judgement. The two best signs to verify US currency are the watermark and the embedded strip. Both can be seen when you hold the bill up to the light. The watermark is on the right and should roughly match the portrait. (The watermark should only be visible when you hold it up to the light, it shouldn't be visible sitting on a counter.) The strip should be on the left and say "USA TWENTY" for a twenty and so forth. Those are the easiest and best signs to look for (for denominations of $5 and up). And yet, the counterfeit detector pen is still a hot seller! Perhaps I'll start carrying coffee filters to the store with me. When someone uses the pen, I'll whip out a coffee filter and try to convince them it's money. 1) At this point, one dollar bills are not watermarked and don't have the plastic strip. They're also the only bank notes that haven't been redesigned in the last twenty years. 2) Any note that has a seal identifying the Federal Reserve Bank it was issued by (thereby marking it as being of the same design vintage as the singles)will also lack the watermark and strip. 3) The strips fluoresce under UV. Each denomination fluoresces a different color. The cash register at my store has a built-in black light for testing this. I can state from having used the thing that it can a stone pain to spot the strip and verify the color. The hundreds (for which you would think it was most critical to be able to see it) are evidently the worst. They're supposed to glow red. By shading the viewer, I can usually manage to make out a pink glow, sort of. This is not reassuring. I've decided that the water mark and irridescent numeral are the easiest verifications. Hi Heather, thanks for the info. I don't think dollars are counterfeited much - doesn't seem worth it to me. Yes $20's seem to be the target value for counterfeiters. Big enough denomination to be worth the effort, but small enough to fly under the radar of going through any further trouble - like checking the watermark. I want to take the opportunity to thank all the skeptics that have come to visit, with a special thanks to Dr. Janet Stemwedel for putting together such a great Skeptic’s Circle! While you are here, may I suggest that you may also be interested in my other articles? I’ve selected some items that I’m especially happy with and have listed them on the bar to the right under the heading, “Highlighted Essays”. I also have a list of articles sorted by labels further down the right hand bar, just in case you want to further subject yourself to my writings. Yes, U.S. bills have watermarks, as well as these neat little plastic microprint strips. Them put them into bills miles of strip at a time. Sorry, but I have seen someone reproduce the strip AND the watermark (that could only be seen when held up to the light). Also, it's not just coffee filters that will pass the pen test...but I better not say what it is or there would be a LOT more counterfeit bills as it is a very common product. As far as I know, the only ones that have duplicated the embedded strip are the North Koreans & their "supernotes". Some claim that one way to tell them apart is that they are actually better quality than the real thing! The worst part of this is the stupidity of the US government. The Treasury Dept purchased the rights to a specific color of that color shifting ink used on the most recent bills from the Swiss company that invented it. The the North Koreans purchased a similar color from the same company. US currency can be varified by the embedded strip and the watermark. We can see them simply on the light. P.S. Take care of your money. Do not leave them for wash any more! CreditCoacher, I removed your hyperlink because it violated Rule 6 of my Comment Moderation Policy. This is your only warning. I used the suave extra hold 7, due to the fact that suave extra hold 2 was not available. I used 25%cotton paper that was acid free and lingin free. It did not pass. I used the recyled paper and did not pass. WHAT TYPE OF PAPER DO YOU NEED AND DOES THE PAPER HAVE SPECIFIC SPECS? WERE CAN YOU BUY THIS PAPER AND DOES IT HAVE STARCH IN IT? I.Q. - Most paper has starch in it, except the types of paper where starch would actually be harmful to the designed usage - such as paper towels or coffee filters. The problem with hairspray, as I noted in my article, is that if you just spray it on and wipe it off it won't work! You have to spray it on and let it dry in place. Now, having said that - I'll also say that if your are truly scientifically curious then you should be willing to run tests. Don't wait for me to tell you the answer! I'm NOT doing this to teach people how to counterfeit money - I only wish to prove a point about the counterfeit detector pen, using a technique mentioned by "The Amazing" James Randi. UV light is perhaps the best defense against counterfeit US currency. Our currency absorbs 100% of UV light. Counterfeit will flouress like a white shirt under UV light. Any place the ink stops or the note is cut, it will flouress. I just got a $5 bill back at LaserQuest, where they use UV light for special effects. Well this bill fluoresces under UV. I compared it with two other $5 bills from 2003 and they were dull, while this one was significantly whiter. So what gives? Did this bill go through a wash with bleach? Or are the North Koreans doing $5 bills these days? It may have went through the wash. It doesn't even require bleach - color brighteners in the wash will cause clothing to have glowing specs under a black light. Other chemicals may also cause it to glow. Hairspray perhaps? I read some years ago that many counterfeiters bleached one-dollar bills, then used the paper for counterfeit bills of larger denominations. It seems to me this pen would not detect such counterfeits. Yes, 1s and 5s are frequently bleached and reprinted as 20s, 50s, or 100s. The bank where I work receives such counterfeits weekly - sometimes with the DriMark yellow ink still visible. Sometimes customers even argue when we short their deposits because they "checked it with the pen." took that 1977 100 dollar bill back to bank. even though it failed the pen test they exchanged it for a good one. Ive been trying to find that pen everywhere for my boss, we use these UV Counterfeit Detection Light which are always going out or causing some sort of issue. This causes a lot of conflicts with the clients. Therefore, we are planning on utilizing a pen which will probably malfunction less than a UV light. @Calladus: You should be able to see the watermark from both sides of the bill since it is embedded in the bill, not printed upon it. The older bills too. However, we will be keeping the UV light so there will be an alternative. It would have been cool if you hair sprayed it in front of her... but that would have been pushing it. You could bring along a coffee filter, and show her that it is NOT counterfeit! Clearly the DriMark pen is not a perfect anti-counterfeit device but otherwise many places, especially smaller businesses, would just accept any bill unless it didn't even look close to a real bill. Yes, but if I were a counterfeiter who doctored my bills to pass a DriMark Pen test, the I would WANT to pass them off at a store that uses such a pen, as opposed to another business that didn't rely on the pen. If someone suspects that a bill is phony, and the pen says it is good, they will be more likely to override their own hunch and accept the bill without looking closer. Having said that, I'll poke a hole in your argument by pointing out that the DriMark pen is so cheap that any small business could afford one. I would assume that a business would not have a pen for many reasons, not necessarily because it is small. CTP - your comment was refused for blatantly violating rules 6 & 7 of my comment moderation policy, and by being so shameless you've also violated rule 3. Well, I tried to do some shopping today and handed the cashier $120 (one $100 and one $20). The cashier did the "pen test" and both bills "failed" the pen test. I handed the cashier another $100 bill and it also failed. I was worried because I initially thought the bills were fake. The $100 bills was obtained from a currency exchange place overseas. But I remember the $20 bill was from an ATM in the US ... and that got me thinking ... may be the pen the cashier used was bad? I goggled and found this page. After I read this page, I went and bought the "Counterfeit Detector" by Sharpie. Anyway, on the package, it stated if the marking is dark, it MAY BE a fake. I used the pens I bought and test them on regular paper and the paper turned dark. 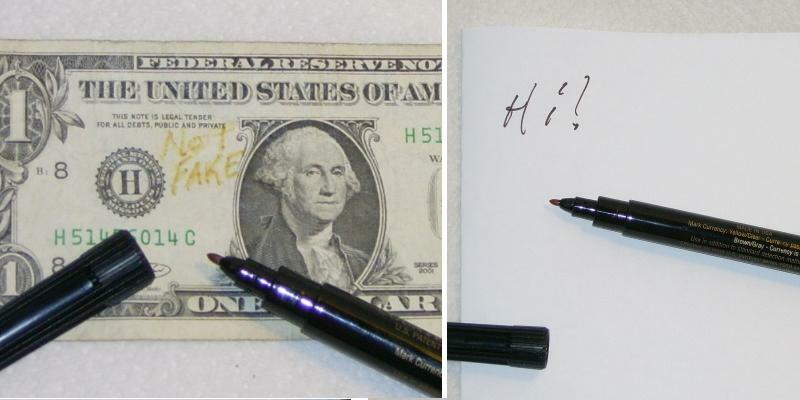 I then test the pens on a $1 bill and the test passed. At this point, I was sure the pens I bought worked. I finally tested the pens on the two $100 bills and the one $20 bill and those passed as well. I examined my bill and all have the watermark, the security strip with the correct denomination, on the bottom right and the 20 or 100 changes color when you view the bill from different angles, and the paper feels real and has some red and blue fiber on it. At this point I was pretty my three bills were real. Since most cashier would probaly freak out because of the mark left by the initial false positive pen test, I will need to take it to the bank, explain the story behind the bill and let them make the call. (I think bringing my pen and test it on paper, $1 bill and my bills will help to prove that I am not trying to deposit fake money.) But this was a scary and inconvenience experience. Obviously it proves that the pen the cashier used was bad and it "taints" real money because of a false positive. Plus, even though I paid for my items with a credit card, it made me looked stupid. But I learned something from it and now I have my own pens, and use them with caution. I tried this test with sevaral hairsprayes and to no avail wut is your Secret? Let the hairspray dry completely on the flat paper. Don't pick it up, or it will run off. Don't wipe it until it dries. And don't be doing anything illegal... okay? I own a small business here in California. I just received a $50 bill which passed the "pen test" but the bank did not accept it and flagged it as counterfeit. I assume it was created with this same method. I am extremely disappointed. We have received counterfeit in the past... another $50 bill which passed the pen test because it was actually a $5 bill whose corners were cut and had the "50" glued by some means to the corners. It looked real because about 90% of it was, in fact, real. We also had a $10 counterfeit bill which was not pen checked because of the low denomination. It's definitly not a huge loss, but it's the principle that upsets me. I've trained my employees to look out for these strange bills but I believe they, and myself to a certain extent, rely too much on the pen. Lesson learned. I loved your blog! I'll save the experiment for my grand daughters when they get older. I now feel confident about whether a store, or even the bank, is handing me a counterfeit bill. I almost bought counterfeit pens for my family for Christmas. Thanks for the insight on the pen's flaws! Unfortunately, most people don't look at the bills handed to them; they just tuck them away in their wallets, handbags, or pockets. I will look at my change from now on. Twenty is written under the seal on the right and on the bottom right of a 20 dollar bill. A quick overview of the bill will ensure the denomination matches (ie. 20 and twenty)so I don't end up with a changed one or five dollar bill. After checking all my bills, the watermark is now easy to distinguish. Thanks again for great info and interactive fun! I recently got refused usage of a £20 by one of these 'pens'. When I took it to the bank, they did all the usual tests, and even checked it under UV and said it was fine - and then replaced it. After having read this though, I suspect that the reason it may have come up as a false positive is because I tried to use it in a place selling baked pastries (which contain starch) and some must have transferred onto the note as I gave it to them. Jessica Jackson I've deleted your comment, and added you to my SPAM filter for blatantly violating rule 6 of my comment moderation policy. I just denied a comment due to a violation of rule 6 of my comment moderation policy. I won't even say the person's name since that was a link to his online store. This blog is currently fully moderated. This means that you must follow my moderation policy, or else your comment will be blocked.